"Learning to shift our mindset of how we see the world can make the ultimate difference" says Simon Sinek, Contributor - CNBC Make It. 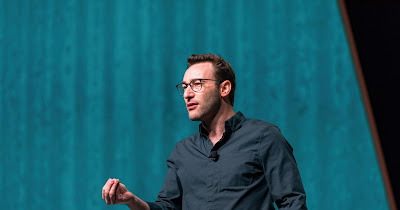 As an unshakable optimist, Simon Sinek has many ideas about how we, as a society, can build a brighter future together. Those ideas have inspired him to do many things. For starters, he's written books — a lot of them. His best-sellers include "Start With Why" ( Tony Robbin's staple book for when he needs inspiration), "Leaders Eat Last," "Together is Better" and "Find Your Why." Sinek's new book, "The Infinite Game," will be released in June 2019. And his 2009 TED Talk about how great leaders inspire action rose to become the third most-watched talk of all time on TED.com. Sinek says he wouldn't have been inspired to do any of those things if it weren't for books. There are two in particular that he calls life-changing: "Man's Search for Meaning" by Viktor Frankl and "Finite and Infinite Games" by James Carse.